Suseo Station has been confirmed as the terminus of the Suseo High Speed Railway (Suseo HSR), a KTX vertical line connecting Southwest Seoul with the main axis Seoul-Busan (Gyeongbu HSR) at Pyeongtaek. 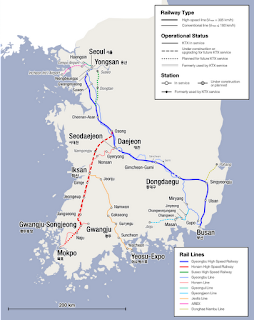 Looking at this old map, covering the Northeastern quarter of the country seemed a priority, but Korail has recently improved the Gyeongchun Line (ITX connecting Chuncheon with Cheongnyangni, Seoul Station), and the Pyeongchang 2018 Olympics will KTXize and extend this horizontal axis ("KTX coast to coast Incheon-Gangneung"), even if it may not reach the East Sea for budgetary reasons. Furthermore, 40% of South Koreans live in Seoul or Gyeonggi-do. So. Again. Ultraprivileged Gangnam-Bundang areas are blessed with major transport infrastructures: Suseo Station, which already connects Line 3 with Bundang Line, will become one of the Capital's biggest hubs. Express Bus Terminal (Lines 3, 7, 9) may have to balance between the KTX stations of Yeongdeungpo (Line 9) and Suseo, whereas north of the Han river, the Seoul Station - Cheongnyangni horizontal axis looks much more simple, with both centers directly connected via Line 1. Dongtan new town is to cover about 24,000 square meters, and to propose 40,000 dwellings to an expected population of 120,000. But today, it is not directly on the subway map: Seodongtan Station is the sole station on a branchlet of Line 1. Among South Korea's biggest harbors and industrial complexes Pyeongtaek will soon add the US troops leaving Yongsan, Uijeongbu, and Dongducheon to an already impressive military hub comprising two USFK facilities. The 61 km stretch will be inaugurated in 2015. When I lived down under Bundang a few years ago I didn't find the Bundang line so convenient. It only went into Gangnam and to go North was tricky. I don't know if the new singbundangline helps, but that still just goes into Bundang. The M bus and Red busses got me places, but still... felt like they could finish up extending the Bundang line into Northern Seoul. There was a plan to connect Bundang with Gangnam Station and Gyeongbokgung. Shelved among others I'm afraid. I remember the condtruction of Bundang, and how fast it caught.